Absent from an education major's schedule is a course on how to juggle distraught parents, a sick student, and a lice infestation while the teacher's broken pearl necklace scatters about the floor in the chaos that is often a day in a third-grade classroom. No textbook had laid out such a daunting scenario for students in Indiana State University's Teachers of Tomorrow Advancing Learning (TOTAL) program, who are working this semester as classroom interns in preparation for student teaching in the fall. 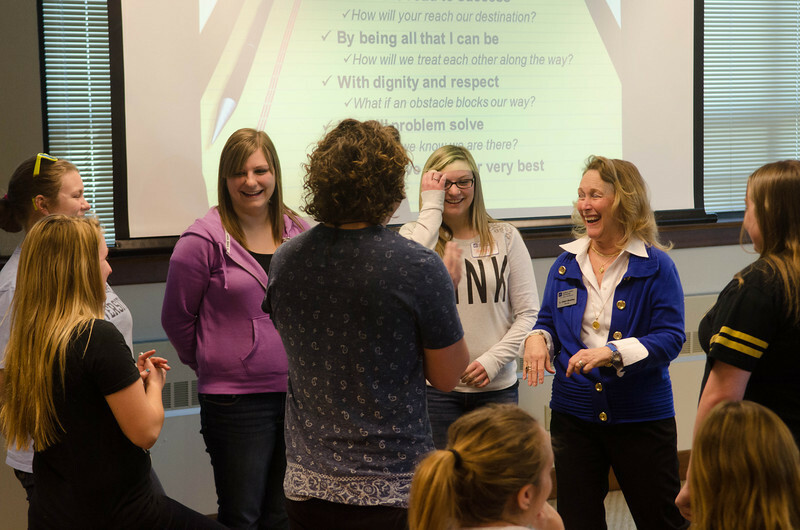 But Indiana State's First Lady Cheri Bradley, who tapped into her nearly two decades as a classroom teacher in several states for inspiration and material, showed the Bayh College of Education students that it's always possible to wear a smile. "I know all of this because I've lived it," Bradley said. "I love to teach because it is part of who I am, and what I share are things I did when I taught and the experiences I had. I just want them to know that what they are embarking on is a great career full of what will seem like challenges, but they're not. They're just new opportunities, and with the right attitude, they can have a positive effect on the lives of young people and serve others." There is no better way to ready students for the future than to hear from the university's first lady, said Marylin Leinenbach, associate professor in the department of elementary, early and special education. "These students are fortunate to be able to hear her down-to-earth examples of what it's like to teach," Leinenbach said. "It's a difficult profession, but Mrs. Bradley offered them ways to deal with things with humor and its advice all future teachers need." Teachers are the No. 1 advocates for their students after all, Bradley said, so she urged budding educators to use educational labels to identify supports but not to define who a student is. It's a lesson that hit home for Bradley in her first special education, self-contained classroom, where she worked with a third-grader who was labeled cognitive delayed. "I worked with him for almost two weeks and knew it wasn't the right label. He was star captain of the baseball team and his cognitive skills did not appear to be in the range they said they were, so I talked to the parents and school administrator and we got him retested," Bradley said. "He tested severe (learning disability). We were able to remove a very stigmatizing label and he was out of special ed by sixth-grade. When he graduated, I got a letter from his mother thanking me because he was on his way to college. Labels can become stigmatizing and we need to be aware of them." It's all a part of creating a space where all students feel safe and welcomed, and the atmosphere can be created through simple gestures, such as keeping greeting cards on-hand to fit situations that may arise in a student or fellow teachers lives, not using sarcasm, and saying ‘goodbye' to each student, especially after a challenging day. "At the end of the day, I would stand by the door, look each person in the eye and say ‘goodbye' because you don't know if they'll come back," she said. "You just don't know what's going to happen each day, so take 30 seconds to tell everyone goodbye before they leave." It was a first-of-its-kind lesson for Indiana State senior Hanna Curley of Terre Haute, who is student teaching driver's education this semester before graduating in December with a bachelor's degree in elementary education. "As future teachers and role models, we will make positive impacts on kids' lives every day and the things Mrs. Bradley explained, the stories she shared about being in the classroom, are things that will help us do that," Curley said. "We couldn't have learned those things from our textbooks." While textbooks remain a classroom staple, Bradley's seminars have also become a core piece of the TOTAL program each semester prior to student teaching. "After (Bradley) did the first seminar for us, I was terrified we wouldn't be able to fit into her busy schedule again but we always have," said Beth Whitaker, professor of elementary, early and special education. "This is such a high point in the semester to have her speak to the students." Indiana State's First Lady Cheri Bradley draws on her years in the classroom to conduct a seminar for TOTAL students each semester prior to the start of student teaching.